I would like to thank Rikki for being an amazing DJ! All night he kept the dancefloor busy!! We used Rikki’s mobile disco for our wedding back last May. He was an excellent host, accommodating with requests and forever enticing people on to the dance floor. Would definitely use him again! Richard was the DJ at our wedding on April 30th 2016. He was amazing. We asked for a variety if songs and we got a massive variety. Such a professional gentleman and very good at what he does! Thank you for helping make our special day amazing! For 2 years in a row I have been selected as a finalist in the Prestigious Welsh Wedding Awards. This is a difficult award to achieve and is only given to members meeting a long series of checks. 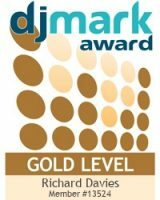 All DJ mark members operate legally and with due regard for excellent customer service. Rikki was amazing! The whole service was more than we could have asked for! People were on the dance floor all day and night! Not to mention the extra trouble he went to to make sure we all had a good time and things ran smoothly! I will be using him again. You’ll be making the best choice for your event if you use Rikki, he made our wedding day!